8Pack, the World's number 1 ranked extreme overclocker** would like to introduce you to his new range of extreme performance PCs. Working closely with most of the world's leading motherboard and memory manufacturers to help improve their product performance, 8Pack uses his expertise to push the limits of performance to astronomical levels. Now he brings this expertise to Overclockers UK to develop and build the most extreme performance PCs on the planet! Obviously, creating a PC to live up to 8Pack's monumental standards is a time consuming, arduous task. Every 8Pack PC is hand-built, from the ground up by OcUK's top ranked master builder to 8Pack's exacting specifications and tuned by 8Pack himself to its own stable maximum so no two are identical, thus creating a truly bespoke system prodigious performance. Creating a system of such power and performance takes an incredible amount of time and preparation. Large numbers of processors are tested and only the fastest few percent are deemed suitable; Our memory is designed at manufacturer level to include only the best, hand-selected chips and our cooling is over-spec'd to ensure the quietest possible operation.The components are tested in prospective motherboards to ensure synergy and BIOS support. These attributes make a large difference to the overall integrity and performance of the system. Once that's done 8Pack takes this efficient combination of cherry picked components and tunes each of them to their peak, thus establishing a harmonious balance. This is why he is renowned as one of the world's best overclockers and why his systems are the zenith of performance. The most powerful single PC system available today. Customisable to your tastes, a multitude of cherry picked components come together in this class leading goliath. Whatever you need a system to do, this can do it faster than the rest. This system uses record breaking ASUS Rampage VI Exteme Edition X299 enthusiast chipset motherboard, which we watercool for maximum stability. This motherboard is fully featured and rock stable when pushing a mass of components to their absolute max frequency in a stable manner. The system houses an Intel i9-7980Xe 18 core, 36 thread, CPU which is overclocked to the maximum stable clock of 4.6GHz. These CPUs are the ultimate consumer powerhouse and eat today's heavy workloads for breakfast and are especially good in multi-threaded tasks such as rendering and encoding. The RAM in this system is a massive 128GB of hand picked 3200MHz DDR4. The ICs on these kits tune well for efficiency as well as matching well with the aesthetics of the ASUS motherboard. This gives the CPU all the bandwidth it needs to complete your tasks faster than ever before. The graphics power in this system is provided by two of Nvidia's flagship cards, the RTX 2080Ti, configured in SLI (NV-Link) which are watercooled and pre overclocked. These cards feature an insane amount of memory bandwidth, enabling everything, at any resolution!!! Any amount of monitors!!! Simple as!!! And ready for 4k screens too!! Storage is brought to you via an Samsung 970 PRO Polaris 1TB M.2 2280 PCI-e 3.0 x4 NVMe Solid State Drive capable of transfer rates in excess of 3500MB/s. This ensures fast loading of programmes and instant response of the operating system. In addition to this, we have a combined 1.5TB of Samsung 860 Pro Series Solid State Drive for all of your games and applications. This is all backed up by 2x 6TB drives configured in RAID 1 to ensure that you never lose any of your most important data!! - Two man specialist delivery and installation. * Please note - Due to 8Pack work commitments the minimum lead time for these systems is 28 working days. We will always endevour to meet this deadline but at busy times delays may occur. We will keep you informed of the system build progress. 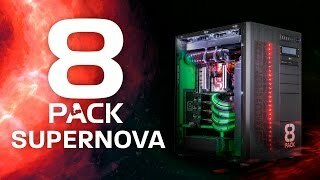 More links for "Supernova - Intel Core i9 7980XE @ 4.6GHz DDR4 Extreme Overclocked PC"
Brought this system and it worked plays everything 4K ultra. "Overclockers UK delivered its system bang on time, with perfect stability (an achievement that’s eluded many dream PCs in the past), despite the machine sporting a monster overclock and being the fastest overall system on test. In some cases, it was considerably faster than the competition too."